This is the Concavenator corcovatus, a new species of dinosaur discovered in Cuenca, Spain. This weird 20-feet-long predator could be the predecessor of the meat-eating titans that dominated the Cretaceous. But what's that hump? It could be his battery. Scientists believe that this dinosaur—which was unearthed almost complete—is the earliest member of the Carcharodontosauria, the titanic flesh-eating monsters that ruled our planet 145 million years ago. This family included gigantic beasts like the Giganotosaurus, which could measure up to 47 feet. According to the study, published in Nature, the new dinosaur shows some peculiar bumps on one of its arms' bones. This is another very surprising feature: These bumps served as anchors to large feathers in small dinosaurs that were more closer to birds than others. 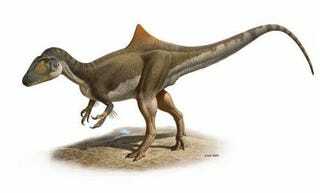 However, the Concavenator corcovatus belongs to a much earlier period, and it was larger than those. The discovery could show that feathers appeared in these animals earlier than was expected. It is the first time we have ever seen a structure like this on the spine of a dinosaur, although it is common on some animals today, such as cows. At the moment, the function of this structure is unclear. We believe that the animal was not diseased because the spine shows no sign of being cracked or broken, we think it is a feature of this species. One hypothesis is that it was a reservoir of fat. That fat could could have been burned in periods of hunger, acting as energy storage.